Bookride: William Golding. 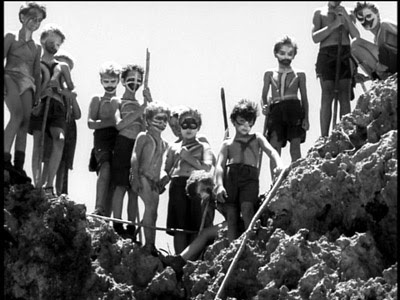 Lord of the Flies, 1954. "... a very serious book ... written with taste and liveliness, the talk is natural, the descriptions of scenery enchanting. It is certainly not a comforting book. But it may help a few grown-ups to be less complacent and more compassionate, to support Ralph, respect Piggy, control Jack and lighten a little the darkness of man's heart. At the present moment (if I may speak personally) it is respect for Piggy that seems needed most. I do not find it in our leaders." E.M. Forster , introduction to Lord of the Flies 1962. "I have lived for many years with small boys, and understand and know them with awful precision." William Golding, 1965. William Golding. LORD OF THE FLIES. Faber and Faber Ltd, London 1954. A dystopian 'Coral Island' and a great classic of the Atomic Age. Not at all easy to find in superior condition as the book was read, especially by younger readers, and the yellow jacket is easily soiled and often fades. Many copies went to libraries. "Time: The Future. Absurd and uninteresting fantasy about the explosion of an atomic bomb on the colonies and a group of children who land in jungle country near New Gunea. Rubbish and dull. Pointless." However it was Faber (due to the perspicacity of Charles Monteith) who published it after quite radical revisions to the first chapter, changes which Golding was happy to make. It was at that point called 'Strangers from Within' - the actual title was thought up by Alan Pringle at Faber. 3040 copies were printed and they sold slowly until good notices started to appear and E.M. Forster chose it as his book of the year for 1954. 'Bibliography is a lie' I was once informed by a prominent Texan dealer in Americana - 'if you cite enough of it you can make any edition of any book sound significant.' In the bibliographical spirit it should be noted that the book can turn up with a wraparound band (sometimes known in USA as a 'bellyband.') This has reviews on it and was presumably placed on it at at a slightly later stage, eg. it quotes Arthur Calder Marshall's BBC review - 'A dizzy climax of terror.' This band, unknown to Gekoski and Grogan, can turbo charge the asking price to a stonking $19000. TRIVIA * An episode of The Simpsons titled Das Bus was a parody of Lord of the Flies, mirroring it in many ways. For instance while trapped on an island, they use glasses to make a fire and also hunt pigs. Another Simpsons episode, Kamp Krusty , also makes some reference to the novel. * Nick Hornby commented that a newer novel, The Beach , is: "A Lord of the Flies for Generation X". *Art becomes reality T.V. - A film adaptation of the book was one of the main inspirations for the reality TV show Survivor All Stars, according to host Jeff Probst. 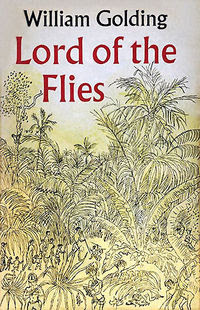 *Lord of the Flies is referenced several times (often jokingly) in the TV drama Lost which is also set in a desert island when the characters feel they are under the threat of turning wild. LORD OF THE FLIES is one of my favorite books of all time. I first read it when I was a junior in high school and was deeply impressed by the wonderful story. The story is full of vivid images that become frozen in one's mind.